Moving freight is the greatest challenge in the development of a workable carfree city. 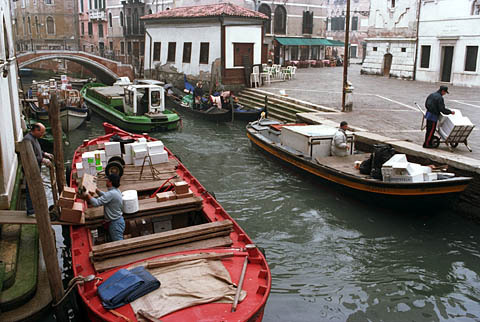 Venice uses its canal network to move freight both internally and between the city and the mainland. This system does work, but the extra handling, small capacity of the boats, and the slow speed of water transport impose extra freight costs in Venice. It is also possible to conduct all internal distribution of foodstuffs and other goods using electric vans of the type commonly used in the 1920s and 30s. These vehicles could be speed-limited and would be quiet. The modern carfree city must offer fast, cheap freight service. This can best be accomplished with "metro-freight," a dedicated freight delivery system based on metro technology and the use of standard shipping containers. The metro-freight route is shown in blue on the Reference District page. Metro-freight moves all heavy freight except locally, within the district, thereby holding street traffic to an absolute minimum. Trucks would only enter the city under exceptional circumstances. A detailed description of the proposed metro-freight system takes up a full chapter in Carfree Cities. 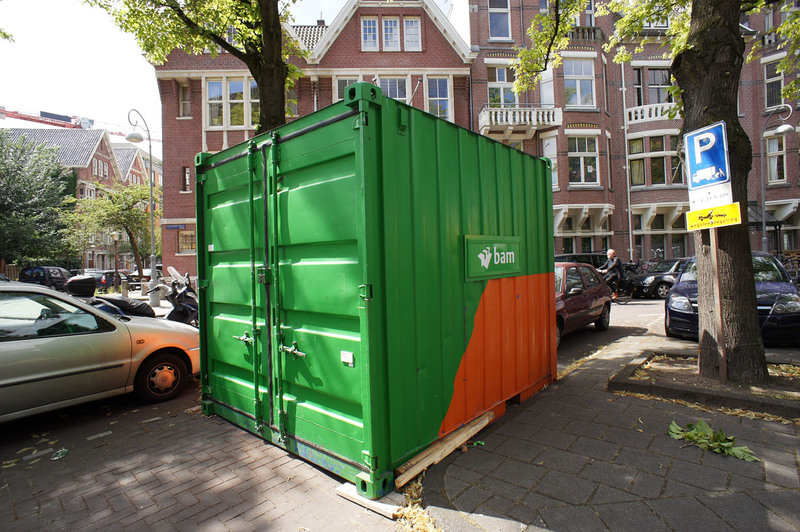 A 10-foot shipping container, the smallest size in normal use, looks large on the streets of Amsterdam. Containers up to 53 feet in length are used around the world to move most cargoes except bulk materials. Freight is moved in standard shipping containers, which arrive in the utility areas where they are transshipped to metro-freighter. Large storage yards accommodate containers awaiting dispatch into the city. Rail, road, and ship deliveries can be accommodated. 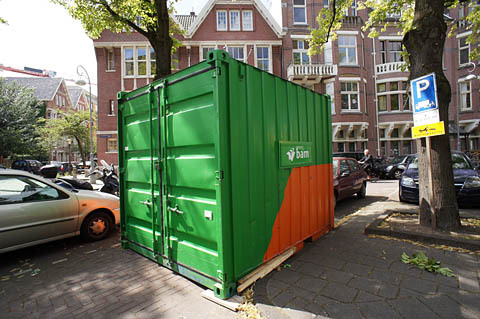 Air-freight containers are flimsy and cannot be handled automatically, so they would not be brought directly into the city. 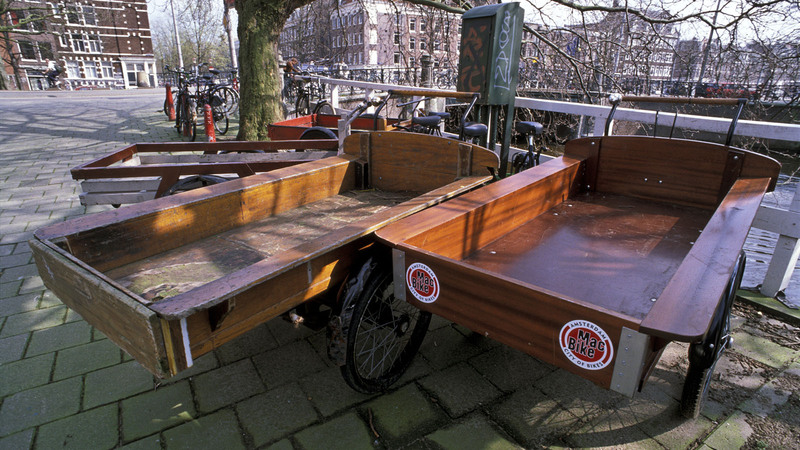 Traditional freight bikes in Amsterdam. Groceries and other consumer items weighing up to about 100 pounds (45 kg) are hauled by the consumer using a pushcart. This solves most of the problem of deliveries to homes. Large items such as furniture are delivered via the local stores or from depots located on the metro line. Ordinary freight bikes can be used for much local freight, but battery-powered forklifts and other slow, small vehicles can move heavy freight within the district. A shipping container requiring delivery to a destination not directly served by metro-freight is loaded onto a wheeled chassis and moved to its final destination under battery power. The speed limited to a fast walk, but the distances are very short, so speed is unimportant. The normal metro trains could haul a freight car at the back of the train where bicycles and pushcarts could be carried. These could be loaded and unloaded quickly enough not to interfere with the regular operation of the train, thereby providing a solution for small freight requiring immediate carriage.